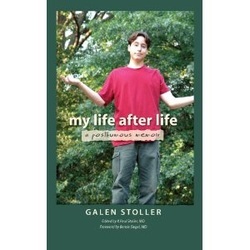 My Life After Life: A Posthumous Memoir, Galen Stoller, Edited by K. Paul Stoller, Dream Treader Press, Santa Fé, New Mexico, 2011. Available in Hardback and Kindle. While posthumous publications are not that unusual, having one actually written or dictated by someone who is already dead, is less common. Galen Stoller, named as the author of this work, had a short life, from 1991-2007, when aged 16 his car collided with a train as it crossed a railway track. This is where the story begins, rather than where it ends. In the world of psychic phenomena channelled communications from discarnate beings, whether group entities, individuals or non-human intelligences, are not uncommon, but their messages tend to represent a continuation of their work on earth or to offer wisdom and guidance to those still on the physical plane (cf. Jon Klimo’s Channeling, 1987). Galen’s story is neither of these. It records a young man’s adventures in the first months and years after his death. The information is passed through a medium to Galen’s father, who adds an editorial note with his perspective on their communications at the end of each chapter. Although we are not told much about the process of transmission and editing, it is clearly very much a joint project, arising out of K. Paul Stoller’s need to have contact with his son as much as Galen’s desire to communicate his new state of being. The closest parallels to Galen’s account are the Letters from our Daughters, Part 1 Sally and Part 2 Patricia, published as Papers 1 & 2 by the College of Psychic Studies in London in the 1970s. These also depended on a parent child link, the medium being Patricia’s mother Cynthia Sandys, and the editor, or joint editor, Sally’s mother, the writer Rosamond Lehmann. The mood and content, the intimacy and sense of mingled loss, regret, delight and curiosity, is not dissimilar in all three works. The view of the Afterlife and how it ‘works’ is also consistent across time, although references to anti-matter and the matrix, which feature in Galen’s account, are absent from those of Sally and Patricia. The consistency between accounts such as these, and many others from various sources (near death experiences, hypnosis, out of body journeys, meditation and so on) is impressive. The differences that exist are entirely consistent with notions of the creation of worlds through thought and expectation, and of like vibrational frequency attracting like, common to all these accounts. So what is Galen’s world like? He describes it at one point as ‘Heaven 101’ - the beginner’s class where he is just learning the rules of discarnate living. Robert Monroe would probably describe it as ‘Focus 27’, where the ‘Reception Centre’ or ‘Park’ for those who have recently crossed-over is situated. In Theosophical teachings we would recognise it as the higher astral planes, inhabited mainly but not exclusively by humans, who create simulacra of their earth environments, and group together with those of similar beliefs and interests. It is the plane of creativity and learning where the lessons from past lives are assimilated, skills and talents further developed, and creative interactions with those on earth encouraged. The first lessons are in the process of creation and movement through attention and thought. Galen’s world is at first confined to a chair, and he fails to perceive anything that he is not directly focusing on - a shifting, confusing world of fleeting images. With practice, and the guidance that is always available, he learns to move between ‘levels’, to see more and create more, such as a cool-looking apartment that he could redecorate at will, which he then learnt to sustain without having to stand in front of it. To be able to create a ‘home’ which he could leave and return to demanded ‘setting an intention and leaving it in place, and maintaining it without getting distracted’ (p.52). Galen’s accounts are very similar to the process Bruce Moen describes using The Monroe Institute methods of focusing on particular brain frequencies in order to explore the astral realms (Voyages into the Unknown, Hampton Roads, Charlottesville, Virginia, 1997). During his first training programme at TMI, Moen is taught to create an astral home that he can return to over and over again. In his case a thatched beach hut beside a mountain lake, with hanging chairs suspended from the roof. As Patricia and Sally make clear in their conversations with their mothers in Letters from our Daughters, such creations are not necessary, the non-physical body does not need shelter, food, rest, or even a body, as the latter is only a creation of consciousness, but these creations help the newly arrived readjust and adapt, until they are ready to discard them or to move onto higher spiritual/frequency levels. Another intriguing parallel, one of many, between Galen’s account and those of Patricia Sandys, is the existence or possibility of connections based on relatedness, not just at a spiritual or soul group level, but through kinship. Patricia had died after a year of marriage, longing for a child but not yet a mother. In the non-physical world her intense desire is rewarded by the birth of a spirit child; ‘under my heart grows the conscious and subconscious entity of a child. She (it is a girl) has come to me in all the beauty of a complete personality, known and loved by us in other lives’ (p.4). Galen was surprised to discover he had a kid brother, Carl. While hiking in the familiar New Mexico scenery he has learned to create, Galen finds that he is being followed very determinedly by a child. He was somewhat surprised as people of similar experience tend to find themselves at the same level, and children usually go to their own place where they can grow and be looked after. He assumed that Carl was lost and wanted to take him back, but Carl insisted that he didn’t want to go back and grabbed Galen’s hand; ‘With this simple act, I was downloaded an incredible collection of images and a profound sense of innocence that expanded my whole universe. Although Carl looked like a child, he was clearly a very progressed individual with a highly developed sense of intuition and understanding’ (p.114). Carl insisted that he was Galen’s kid brother, and that they belonged together. Galen’s teacher later explained to him that one of the agreements he had before his last incarnation was to come into the same family as Carl as his big brother, but that because of the choices many people made, Carl ended up in another family, where he became sick and died at an early age. The experience they had planned to have during their earth lives, they could fulfill to some extent in their current non-physical existence. There are also some lessons about the nature of soul versus linear time - Carl died in 1954, the year Galen’s father was born. When he realised he would not be born into Galen’s family, Carl chose an alternative life from the same century that would maximize his learning potential. My Life after Life is billed as the first volume of the ‘Death Walker’ series. It is beautifully written, with emotional force but not sentimentality. For those interested in exploring the Afterlife it is a valuable addition to the pool of information available. While the series title conjures up a boys’ comic character rather than serious exploration of non-physical realms, I greatly look forward to the next book of Galen’s adventures in ‘Heaven 101’ and beyond.